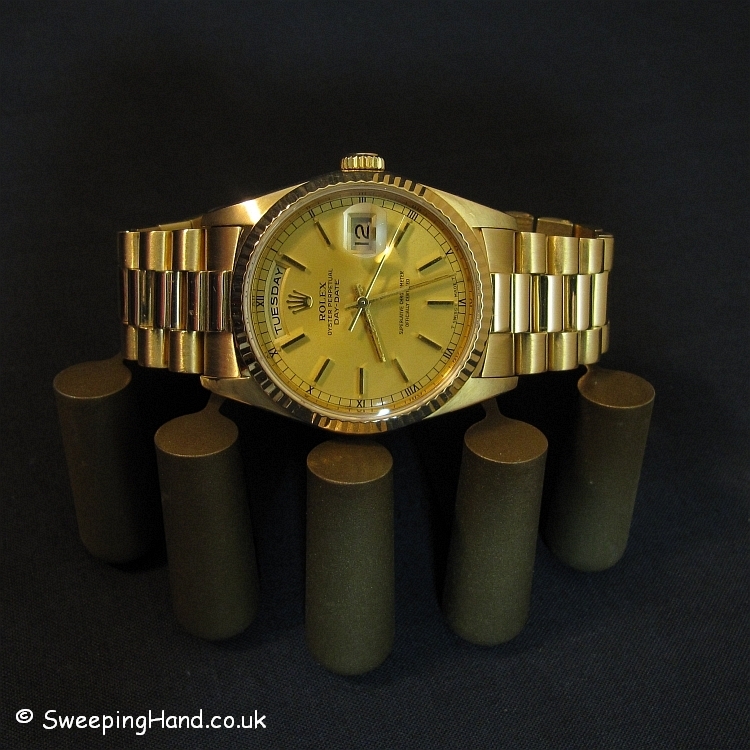 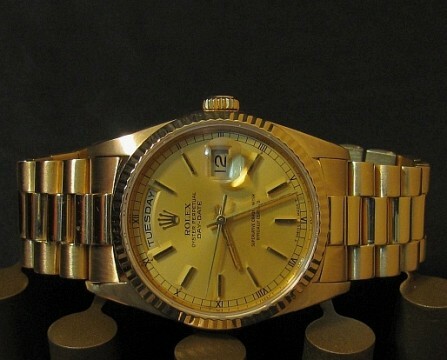 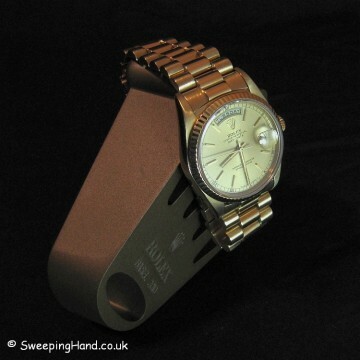 Here we have a truly beautiful solid gold 18ct Rolex Day Date. Gold Rolex are really becoming in demand and as the price of gold has risen so steeply are beginning to look like complete bargains when compared to their steel colleagues. 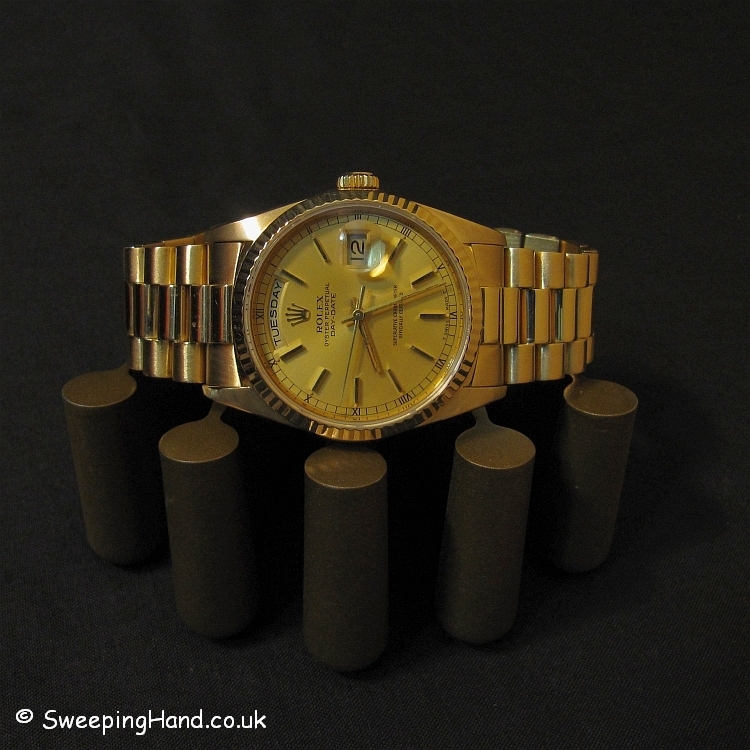 If you compare the price of a second-hand gold day date on a gold president bracelet such as this to the Retail Price of a new one then they are a complete giveaway! 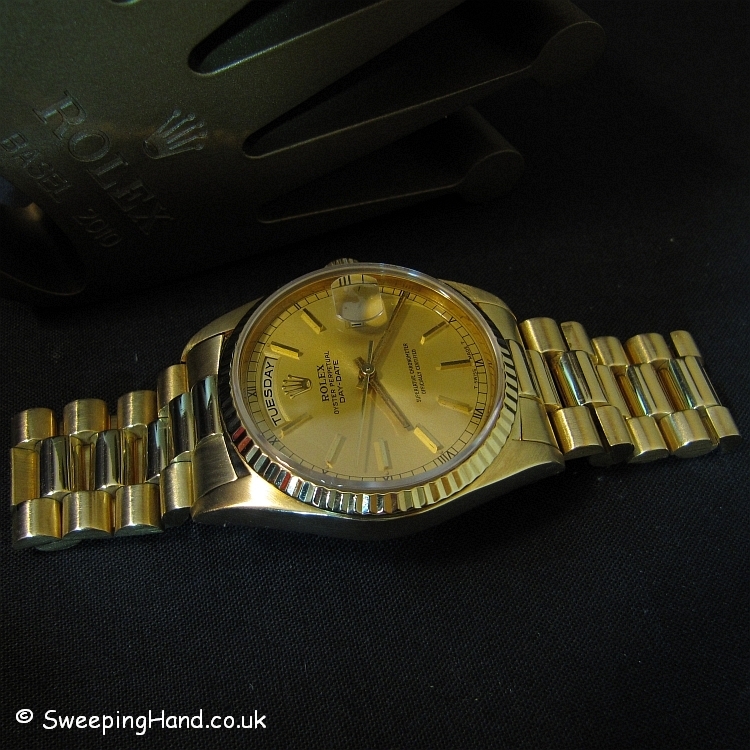 This is a beautiful example from 1990 – an E serial with all numbers clear between the lugs. 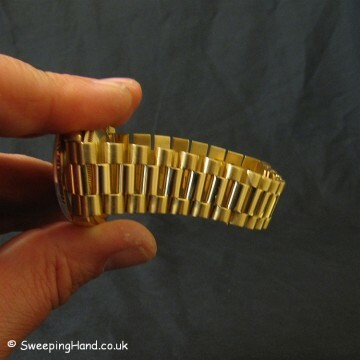 Solid 18ct case in very nice clean condition with no noticeable marks or dings. 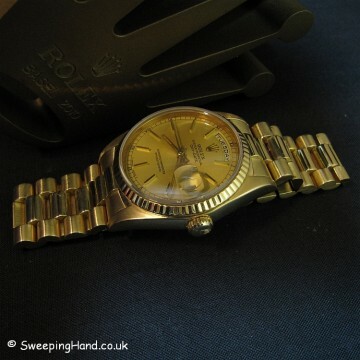 Gold baton dial with outer roman numerals and all tritium plots in place. 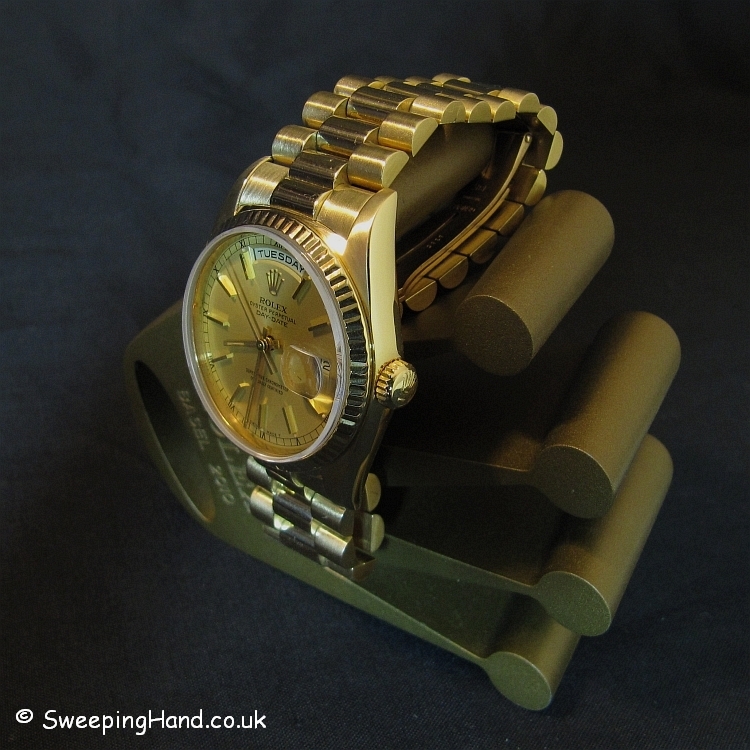 Automatic 31 jewel chronometer movement with double quick set for day and date. Comes with its original solid gold 18ct President bracelet with concealed clasp in very good condition and little stretch. A very classy piece at a price that makes it almost certain that it will rise in value in the future. Dial & Hands: Lovely gold tritium plot dial with roman numerals and perfectly matching original tritium hands. 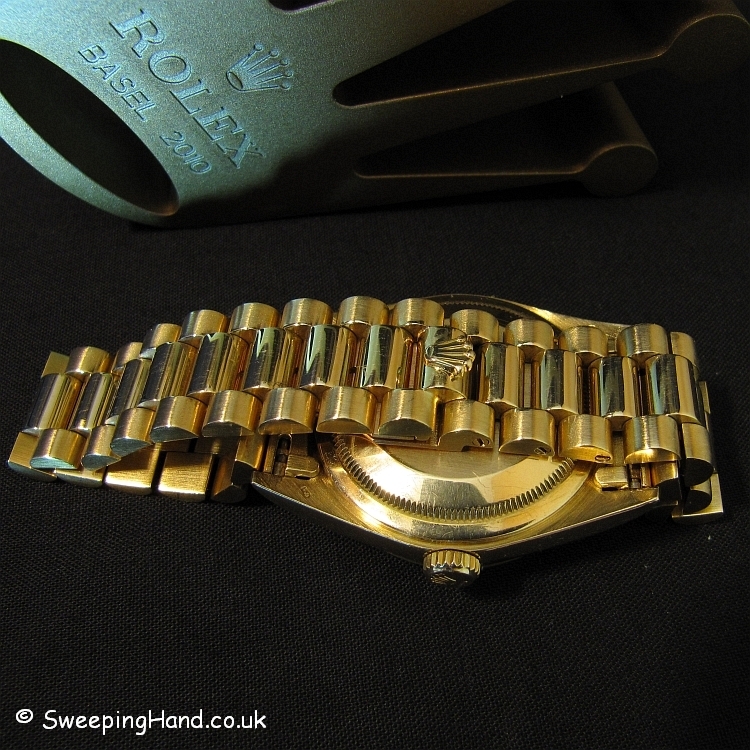 Case & Caseback: Solid gold 18k Rolex case with 18k caseback correctly stamped with model and gold insignia. Correct gold stamps to lower lugs and serial numbers clearly visible between them. 18k gold fluted bezel. 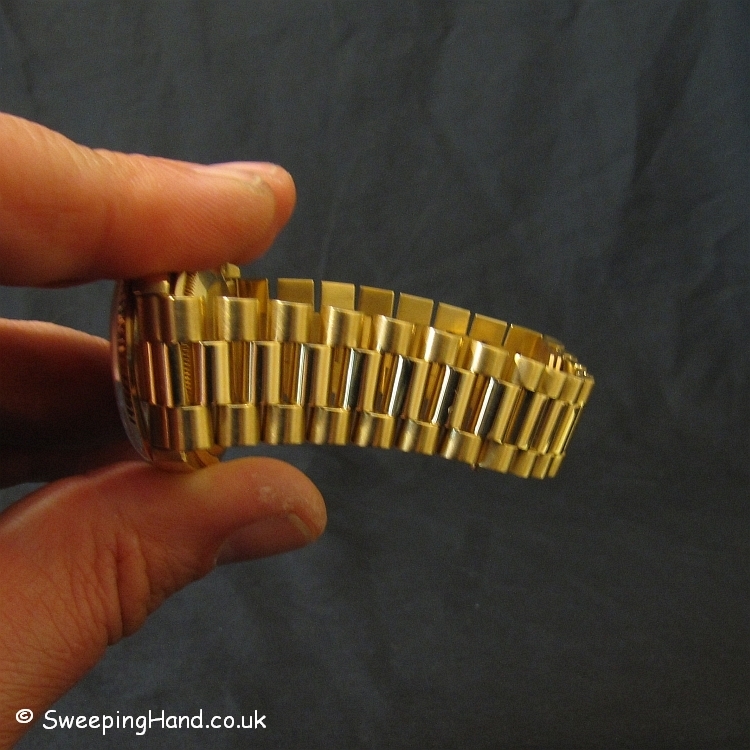 Bracelet: Solid gold 18ct President bracelet with concealed clasp in very good condition and little stretch. 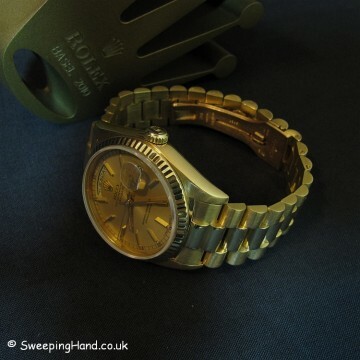 Movement: Automatic chronometer 31 jewel double quick set movement keeping very good time. PreviousPrevious post:Vintage Rolex 5513 Submariner For Sale from 1968 / 1969NextNext post:18k Gold Vintage Rolex Day-Date For Sale from 1972 – Bargain! Am interested and wondering if it is boxed with all papers etc?